Jessica Lacher-Feldman will speak at the symposium, The Well-Dressed Book, Cloth Book Binding in the United States, at the University of Maryland, Friday March 14, 2008. Jessica Lacher-Feldman spoke on PBO at The History, Technology and Conservation of Nineteenth-Century Publishers' Bindings at the Grolier Club in New York, February 22, 2008. Held concurrent with the exhibition The Proper Decoration of Book Covers: The Life and Work of Alice C. Morse From the Collection of Mindell Dubansky, the Guild of Book Workers will co-sponsor with the Grolier Club a one-day symposium dedicated to the history, technology and conservation of nineteenth-Century publishers' bindings. PBO was the topic of a full panel at the Society of American Archivists' annual meeting in Chicago on September 1, 2007. http://www.archivists.org/conference/chicago2007/index.asp The presentation, Publishers' Bindings Online, 1815-1930: The Art of Books -- The Collaborative Digital Project as a Model for Access, Outreach, & Multidisciplinary Creative Success was presented by Jessica Lacher-Feldman, Amy Rudersdorf, and Kristy Dixon and was well-received by the SAA audience. A copy of the presentation is available as a pdf file here. A review and summary of the presentation is described on Spellbound Blog. Publishers' Bindings Online will be the focus the seminar, Developing a Collaborative Model for Researching 19th c. Books and Presenting them to a Larger Audience: Issues and Prospects, presented at the Rare Books and Manuscripts (RBMS) Preconference, "Libraries, Archives, and Museums in the Twenty-First Century: Intersecting Missions, Converging Futures?" in Austin, Texas on June 21, 2006. The seminar will be chaired by Elaine Smyth from Louisiana State University (and a member of the PBO Advisory Committee), with panelists Barbara Walden (UW-Madison, PBO co-coordinator), Jessica Lacher-Feldman (UA, PBO Project Manager), and Sidney Huttner (University of Iowa, and coordinator of The Lucille Project). Jessica Lacher-Feldman, Dr. Micki McElya (Asst. Prof. of American Studies, The University of Alabama), and Dr. Joshua D. Rothman (Asst. Prof. of History, The University of Alabama) presented a panel discussion entitled A Nation Bound: American Publishers' Bookbindings, Imagery, and their Relevance to and Reflection of History and Identity in America's First Century at the American Historical Association/American Assn. for History and Computing on January 6, 2006, at the AHA Annual Meeting in Philadelphia, PA.
Jessica Lacher-Feldman, Jennifer Mathews (graduate student, UA), and Erika Pribanic-Smith (graduate student, UA) presented Publishers' Bindings Online: Building a Multifaceted Collaborative Digital Project at the Society of Alabama Archivists Annual Meeting in Tuscaloosa, Alabama on November 16, 2005. Amy Rudersdorf (UW-Madison) gave a presentation on collaborative digital project management, highlighting PBO, entitled Collaborative Digitization: Creating Cultural Heritage Collections at the MERLOT International Conference in Nashville, Tennessee on July 27, 2005. Jessica Lacher-Feldman (UA) and Amy Rudersdorf (UW-Madison) gave a presentation on the PBO project entitled Publishers' Bindings Online: Reflecting American History and Culture via the WWW at the American Association for History and Computing, Roosevelt University, Schaumburg, Illinois, on April 15, 2005. Jessica Lacher-Feldman and Kristy Dixon gave a presentation on the PBO project entitled 19th c. Publishers’ Bindings: A Reflection of American History and Culture via the WWW at the American Historical Association annual meeting, January 6-10, 2005, Seattle, Washington. Jessica Lacher-Feldman, Kristy Dixon, and Eileen Verchot gave a presentation on the PBO project to the Society of Alabama Archivists annual meeting, October 8, 2004, Montgomery, Alabama. Jessica Lacher-Feldman (UA) and Barbara Walden (UW-Madison) gave a poster session/demonstration at The Changing Book: Transitions in Design, Production, and Preservation, July 22-25, 2005 at the University of Iowa, sponsored by the University of Iowa Libraries. Click here to view an image of the poster. The poster session Descriptive Metadata for 19th Century Decorative Book Bindings, A Collaborative Digital Project was presented at the 2005 Alabama Library Association Annual Meeting in Birmingham, AL. It was created jointly by Mary S. Alexander (UA), Amy Rudersdorf (UW-Madison), and Katherine McGhee-Snow Wilkins, graduate assistant for Metadata, UA. Steven Dast and Vicki Tobias (UW-Madison) gave a poster session on collaboration and UW Digital Collections, which touched upon the PBO project at SHOWCASE 2005 Ideas to Results: Improving Work, Learning, and Climate, April 4, 2005, University of Wisconsin-Madison. Jessica Lacher-Feldman demonstrated the PBO project at a University of Alabama Libraries Show & Tell, sponsored by UA Libraries Digital Program Advisory Committee, February 28, 2006. Jessica Lacher-Feldman, Kristy Dixon, and Erika Pribanic-Smith demonstrated the PBO project in a presentation entitled Books: The First Mass Medium to the students in UA's MC409: History of Mass Communication, Spring 2006. Jessica Lacher-Feldman presented the PBO project and the Development of a Digital Project as a New Model for Academic Librarianship for the IMLS Fellows, School of Library and Information Studies, at The University of Alabama on October 4, 2005. Jessica Lacher-Feldman demonstrated the PBO project in her brown bag lecture, So, What's Cool at Hoole? A Virtual Tour of the W.S. Hoole Special Collections Library, sponsored by the University of Alabama's Women's Resource Center, November 30, 2005. Mary Alexander (UA) demonstrated the PBO project as part of the day long workshop she taught, Metadata Beginnings, November 7, 2005 at the Sterne Library at the University of Alabama at Birmingham (UAB). Barbara Walden and Tom Durkin gave a presentation to staff of campus libraries and members of the School of Library and Information Studies at UW-Madison. The presentation, entitled The Art of Books: Creating the Publishers' Bindings Online Database, included an introduction to publishers' bindings, synergies of the Alabama-Wisconsin partnership, Web interface, creation of the database, database contents and searching, and future plans. Jessica Lacher-Feldman gave a presentation and demonstration to the Alabama Center for the Book Advisory Board, January 28, 2005. Jessica Lacher-Feldman gave a presentation on the project to the St. Andrew's Society of Tuscaloosa, November 2004. Barbara Walden gave a presentation on the project to the participants in the American Publishers' Bindings course at Rare Book School at the University of Virginia. Jessica Lacher-Feldman spoke to the University Women’s Club at the University of Alabama about the PBO project and 19th c. decorative bindings, March 9, 2004. Jessica Lacher-Feldman gave a presentation about the PBO project to the UA Libraries at the Libraries Forum, March 2004. 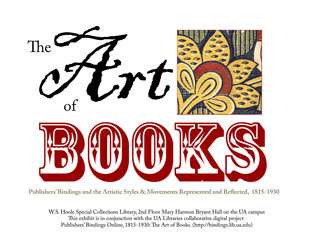 Drawing from the Publishers' Bindings Online project, this exhibit features books and detail images from some of the major artistic styles of the 19th and early 20th century such as Arts and Crafts, Art Nouveau, Poster Style, and Japonisme. Held in part in honor of the 2007 Sakura Festival. Main Lobby, Memorial Library, University of Wisconsin-Madison. Showcasing illustrated bindings from books in the collections of UW-Madison Libraries, this exhibit highlights the library's three-year, Institute of Museum and Library Services grant-funded project to provide a database and related resources to open the world of these beautiful objects, once found commonly in American homes, to a wider audience. Included in the exhibit are books with designer bindings from the 1890s and early 1900s, books from the Civil War and World War I and books from the mid-nineteenth century whose colorful bindings and endpapers depicted and enhanced American's interest in an expanding world. During July-September 2004, an exhibit featuring the IMLS project and books selected for the PBO project from the Library’s circulating collections and recent acquisitions was mounted at UW-Madison’s Memorial Library. This was sponsored by the Silver Buckle Press, the library’s working museum of letterpress printing. A Web version of the exhibit is in progress. A selection of 19th century publishers’ bindings was exhibited in the Gorgas Library on the University of Alabama campus. The exhibit included more than seventy books and focused on publishers’ bindings in a variety of styles and materials with examples produced from a variety of countries, including the US, Denmark, Germany, and Hungary. It served to educate and inform our constituents about the PBO project. 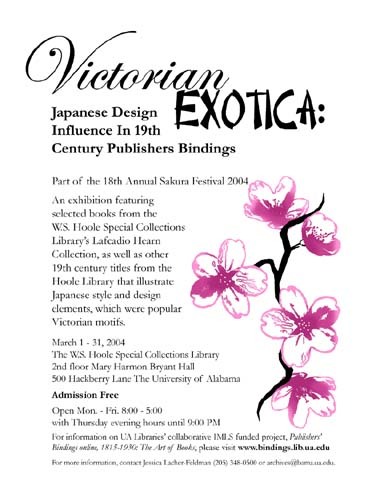 In March of 2004, Jessica Lacher-Feldman curated an exhibition Victorian Exotica: Japanese Design Influence in 19th c. Publishers’ Bindings. The exhibition featured bindings from the 1850s-1910s that embody Japanese style and influence. The exhibit included first editions by Lafcadio Hearn, as well as cloth bindings with Japanese images. As part of the University's and Tuscaloosa community-wide Sakura (Cherry Blossom) Festival, this exhibition received wide publicity and brought visitors to the Hoole Library from the University and the community at large, including visiting students and faculty from Chiba, Japan. In February, 2008, Publishers’ Bindings Online was just awarded “Best Online Archival Exhibition” in the ArchivesNext 2008 Best Archives on the Web Awards! ArchivesNext is a blog on Archives and web/digital technology and is coordinated in part by an archivist at the National Archives. PBO was nominated and voted on by a panel of judges, all of whom are experienced professionals in the archival field. ArchivesNext (www.archivesnext.com) is the Archives and Web 2.0 Technologies blog. PBO will be featured on the site this coming Wednesday, and will feature a discussion of what judges thought gave it an edge over other nominees. Jessica Lacher-Feldman's article, Publishers' Bindings Online, 1815-1930: The Art of Books as a Model for Publicity, Outreach and Promotion of Digital Projects and Online Resources in Cultural Heritage Institutions and Academic Libraries was published in the February, 2007 issue of the Journal of the Association for History and Computing and is available at http://mcel.pacificu.edu/jahc/2007/issue1/feldman.php The article is meant to serve as a model for digital projects looking to promote their work in innovative ways. The PBO project was featured on the front page of the Max Kade InstituteFriends Newsletter (V. 15 No. 1 Spring 2006). The article, "Judging Books by their Covers: Online Resource is a Bibliophile's Dream" by Kevin M. Kurdylo, MKI Librarian highlights the PBO project and the titles culled from the Max Kade Institute for inclusion in the PBO project. The PBO project (episode 004) is featured on the podcast Saving Often -- A podcast of the Sanford Media Resource and Design Center, part of the University of Alabama Libraries. An 11x17 glossy PBO calendar (September 2005-December 2006) was created for wide distribution. This free calendar features sixteen details from PBO books, eight from each institution. The calendar will be distributed at both insitutions, and at conferences, meetings, and other venues throughout the remainder of 2005 and in 2006. The details reflect the mood of the seasons and represent the broad range of materials within the PBO project. Featured are designs by Margaret Armstrong, a first edition of Tom Sawyer, and a rare tartan cloth binding. Click the thumbnail for a larger view of the calendar. Please contact us if you would like to receive a copy of this calendar. University of South Alabama's E-Resources page. 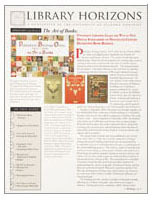 Publishers' Bindings Online was highlighted in the Jane Hedberg's column "Preservation News" in the June 2005 (Vol. 66, No. 6) issue of College and Research Libraries News. Publishers' Bindings Online was featured on the cover of the Spring 2005 (Vol. 18, No. 2) issue of Library Horizons, the newsletter of the University of Alabama Libraries. Library Horizons has a broad readership within Alabama and beyond. The article featured the graphic from the PBO homepage, as well as images from three covers included in the project: Truth Dexter (pba00018), A Warwickshire Lad (pba00056), and Hubert's Wife: A Story for You [A Southern Catholic Story] (pba00458). An image from the PBO project (St. Nicholas, pba02394) was used as the University Libraries' holiday card for 2004. The card, which featured a full color image and descriptive colophon along with the URL for the project, was distributed to ARL Libraries across the United States, as well as to numerous other parties. The Winter 2005 issue of Alabama Heritage magazine featured an image (Aunt Patty's Scrap Bag, pba01251) from the PBO project in the article "Caroline Lee Hentz's Long Journey," by Philip D. Beidler. An article on the PBO project appeared in Issue 33 (May 24, 2004) issue of Libraries@UW-Madison featuring information about the project and images from some of the books to be included in the project. The PBO project was featured in an article on the AHA meeting in Seattle in Silverfish, the official online newsletter of the Association of Library & Information Science Students (ALISS) at the University of Washington. In conjunction with the first version of the PBO database's public unveiling, The University of Alabama's home page provided a link to a feature article highlighting the project. Publishers' Bindings Online was featured on the Librarians' Index to the Internet on April 14, 2005. A brief statement about the project appeared there, along with a link to the project. Six books from the project along with supporting information about Publishers’ Bindings Online were featured in a set of three postcards are used to publicize the events sponsored by the Friends of the UW-Madison Libraries. 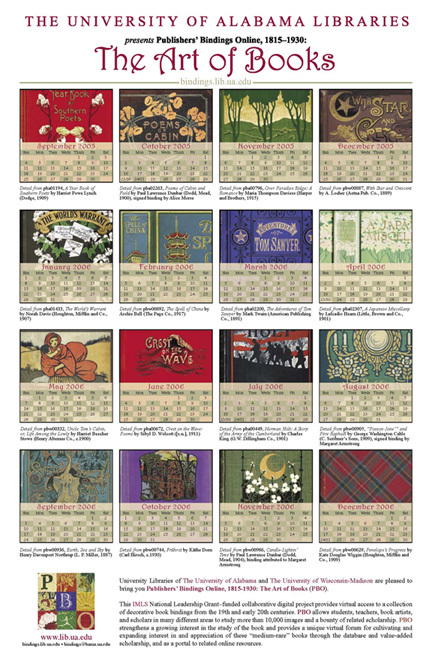 The covers featured on the cards shown here are Dinah Mulock, The Adventures of a Brownie (pbw00531), Louisa May Alcott, Eight Cousins (pbw00581), Millicent Olmsted, The Land of Really True (pbw00529), Joseph Salkind and Rev. James Mackay, The Evergreen (pbw00532), Henry Van Dyke, Little Rivers (pbw00756), and Matilda MacKarness, My Christmas Annual (pbw00533). We recently created a bookmark to mark the launch of the PBO web site. Click here to view a higher-resolution version of the bookmark image.